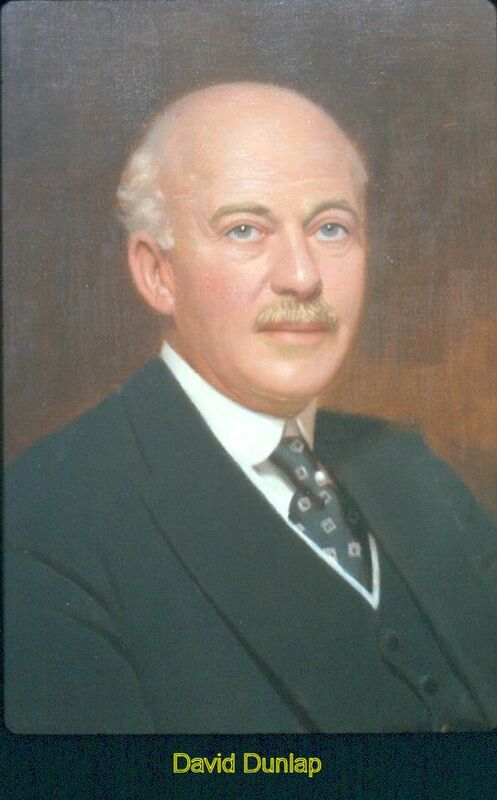 Both the department and the David Dunlap Observatory (DDO) owe their existence largely to the work of one man, Clarence Augustus Chant (1865-1956). 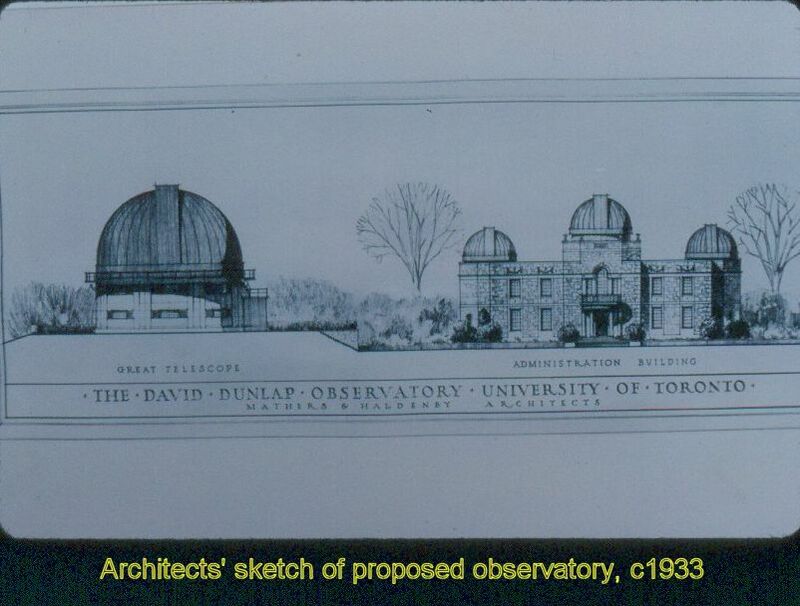 Below is a short history of the efforts of Chant and the developments of the astronomy programme at the University of Toronto, written in 2000 by J. Donald Fernie, former department chair and director of DDO. Chant, born within a few miles of Richmond Hill, was an 1890 graduate of the Mathematics and Physics Honours (M & P) program of the University of Toronto. After short spells as a school teacher and civil servant, he became an instructor in the Physics Department. A later leave of absence enabled him to earn a PhD from Harvard and do some postdoctoral work in Germany. In 1924, a second astronomer, Reynold K. Young, a former student of Chant’s with a PhD from the University of California, who had held staff appointments at Michigan and the Dominion Astrophysical Observatory, was appointed to the faculty. Beginning shortly before the first World War, Chant became absorbed with the idea that the University should have a major observatory. For years he worked tirelessly to invoke enthusiasm for this scheme among University officials, city fathers and private donors. 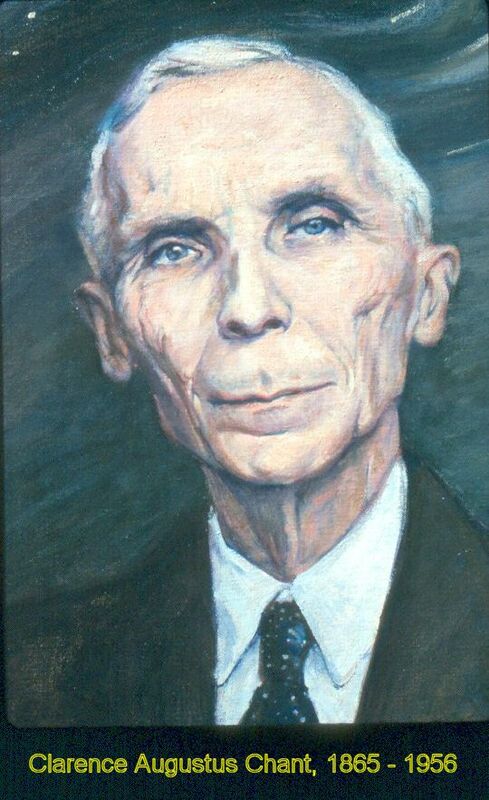 In 1921 he met David Dunlap, a lawyer who had become wealthy from mining investments in Northern Ontario and who had an amateur’s interest in astronomy. 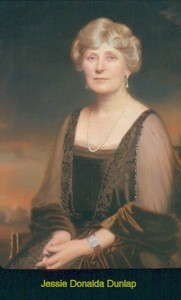 Unfortunately, Dunlap died soon after, but his widow, Jessie Donalda Dunlap, was later approached by Chant with the suggestion that her husband’s name be commemorated by the gift to the University of a large observatory. Mrs. Dunlap accepted the suggestion with enthusiasm, and after much planning by herself, Chant, and Young, the David Dunlap Observatory was officially opened on May 31, 1935. Details. Chant, then 70, retired the same day and lived out the rest of his life at Observatory House on the grounds. Young became the Director of the new observatory, which housed what was then the world’s second-largest telescope. He also became head of the Astronomy Department, a dual appointment tradition that continues to this day, although the title ‘chair’ has replaced ‘head’. The staff was enlarged considerably in 1934/35 with the appointments of Peter Millman, Frank and Helen Hogg, Jack Heard, and Ruth Northcott, with Gerry Longworth as technician/night assistant. Northcott’s appointment was initially as ‘computer’, i.e. an assistant employed for data reduction, but she later became involved in undergraduate teaching. Helen Hogg was appointed Lecturer in 1941 and entered the professorial ranks in 1951. The years through World War II were hard ones, with several of the staff away on military service, and by 1946 Young had tired of staffing and financial difficulties. 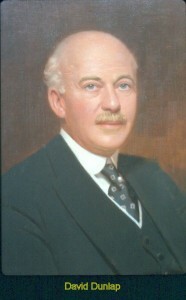 He resigned from the University, and Frank Hogg became Director. Hogg’s tenure, though, was relatively brief, ending with his death from a sudden heart-attack on New Year’s Day of 1951. He, however, had seen the need for an expanded graduate program, and the department’s first PhD, that of William R. Hossak, was awarded in the spring of 1953, closely followed a year later by that of Ian Halliday. The post-war period also brought new staffing initiatives, starting in 1946 with the appointment of the department’s first theorist, Ralph Williamson, a former student of Chandrasekhar’s. Williamson’s interests soon spread to include the new subject of radio astronomy, resulting in the first radio astronomy paper from U of T in 1948: ‘The Present Status of Microwave Astronomy’ (JRASC, 42, 9), followed almost immediately by Northcott and Williamson, ‘Galactic Noise and the Plane of the Galaxy’ (JRASC, 42, 269, 1948). Don MacRae, a former U of T astronomy undergraduate and later a faculty colleague of Williamson’s at Cornell, had likewise developed an interest in radio astronomy while a staff member at Warner and Swasey Observatory, and now met with Williamson from time to time for discussions on the subject. Thus it was that when Williamson, an American, resigned in 1953 to take up a position at Los Alamos (from which he never resurfaced astronomically), MacRae was hired in his place. MacRae interested the Department of Electrical Engineering in collaborating with Astronomy to build a small radio observatory at DDO. A number of antennas were constructed, working primarily at 320 MHz, to observe the sun and a few of the stronger radio sources. The work included the development of an interferometer consisting of two pyramidal horn antennas and of calibration methods to measure the absolute flux densities of the stronger radio sources. The principal result which emerged was the precise measurement of the flux density of the SNR Cassiopeia A at 320 MHz. A precision of 5 percent was achieved, and this result stands out today as one of the earliest precise measurements of a flux density standard. While these developments were taking place in the late 1950s and early1960s, plans were also being made by the two departments to develop a radio astronomy observing site in Algonquin Park, where the National Research Council was preparing to establish a presence in radio astronomy. The Algonquin site was radio quiet by comparison to DDO, and effort was transferred there after the increasingly noisy site at DDO was closed down in the early 1960s. Although some observations were conducted at the Algonquin site by the university, and an 18-m telescope built there, these efforts were ultimately overtaken by the completion of the large 46-m antenna in Algonquin park by NRC in 1965. This new telescope began operation as a national facility for all astronomers, beginning a new era in which the Federal government provides the large facilities needed for the development of the discipline. This new approach, together with similar strategies elsewhere around the world, signalled the end to the operation of smaller university-based radio observatories. Additional small telescopes were added to the DDO complement. Soon after the observatory opened in 1935 a 0.5 m telescope that had been in storage since being built by Young in 1929 was put into operation in the south dome of the Administration Building. It was initially used for direct photography and from 1961 on for photoelectric photometry. In 1951 the historic 15 cm Cooke refractor was brought from the Hart House observatory on campus and established in the north dome of the Administration Building for the use of visiting undergraduates. This telescope had been brought to Toronto for the 1882 transit of Venus, but was little used after the campus telescopes on the McLennan Labs building opened in 1967. It was donated to the National Science Museum in 1984. 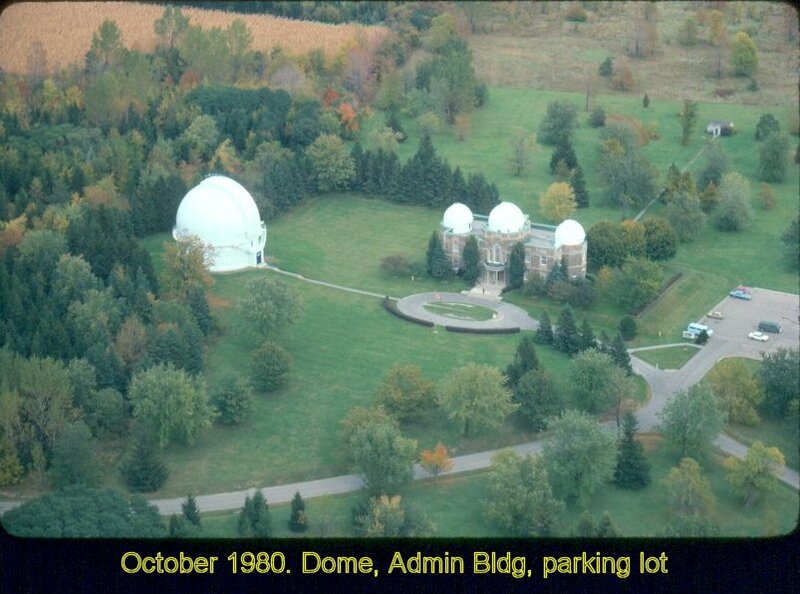 Chant had long hoped that a 0.5 m refractor would be purchased for the centre dome at DDO, but in 1965 a 0.6 m reflector was purchased for that dome and used mainly for photoelectric photometry. The years have brought considerable evolution in the relations between the observatory and the department. Up to the early 1960s all the faculty were based at the observatory. There were only a couple of offices on campus for professors to use while there for classes, and no secretary or other support staff. 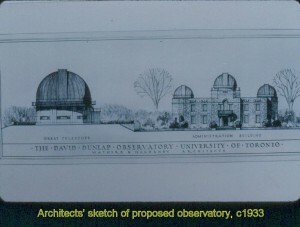 All work, other than undergraduate teaching, was done at the observatory, including most graduate lectures. The entire departmental library was at the observatory, with its first full-time professional librarian, Sheila Smolkin, being appointed in 1969. Two developments accelerated change in this situation: the general rapid growth of university funding in the 1960s, which produced expanded office space on campus, and the quickly growing use of computers in astronomy. These computers were mainframe machines housed at a centre on campus, to which researchers would take their bundles of punched cards for analysis, returning later for a printout of results. Thus when a theoretician, Pierre Demarque, was appointed to the staff in 1962, he decided to base himself on campus for such computer access, and this trend soon developed with the arrival of other theorists and radio astronomers. The campus base was firmly established around 1967 when the department moved from the old Physics Building (now the Sandford Fleming Building) to the new McLennan Labs, and by 1970 boasted three full-time secretaries and some thirty-three graduate students, as well as a small but growing branch of the astronomy library. Nevertheless, some changes took more time. Weekly departmental faculty meetings and colloquia continued to be held at the observatory rather than on campus until 1978, and the exchange of the main and branch libraries between the observatory and campus only took place in 1983, with the librarian thereafter being based on campus and occasionally visiting the observatory’s branch library. Yet further diversification came with the opening during the mid-1960s of first Scarborough, and then Erindale Colleges (now U of T at Scarborough and Mississauga respectively), in each case bringing new faculty appointments for teaching at the colleges. Such appointments, of course, also made major contributions to the department as a whole, particularly in graduate teaching and research. Rapid population growth in Richmond Hill and the surrounding areas brought an increasing light-pollution problem for the observatory, and in the later 1960s the director toyed with the possibility of moving the 1.88 m telescope to some site further north. It was soon realized, however, that if so major a shift was to be undertaken it would be better to deal with poor seeing and poor weather as well as light pollution, and seek to establish a new telescope at an entirely different site where better all-round conditions prevail. At this time a number of major observatories were starting to set up stations in Chile, and Garrison, Racine and van den Bergh, having experienced conditions there, strongly urged that the possibility of establishing a site there be explored. The result was the award of a grant in 1969 from the National Research Council (in its capacity as the forerunner of the Natural Sciences and Engineering Research Council) to purchase a 0.6 m (prototype) telescope from Competition Associates/Ealing in Boston. Agreement was reached with the Carnegie Institution of Washington to locate this telescope at their Las Campanas site in Chile, and further funding for a cottage there was provided by University of Toronto Astronomy endowment funds. Operating costs were initially met by a grant from the University of Toronto Associates in New York, and later by grants from NSERC. The first regular observing run with the telescope was that of Bill Harris in August, 1971. 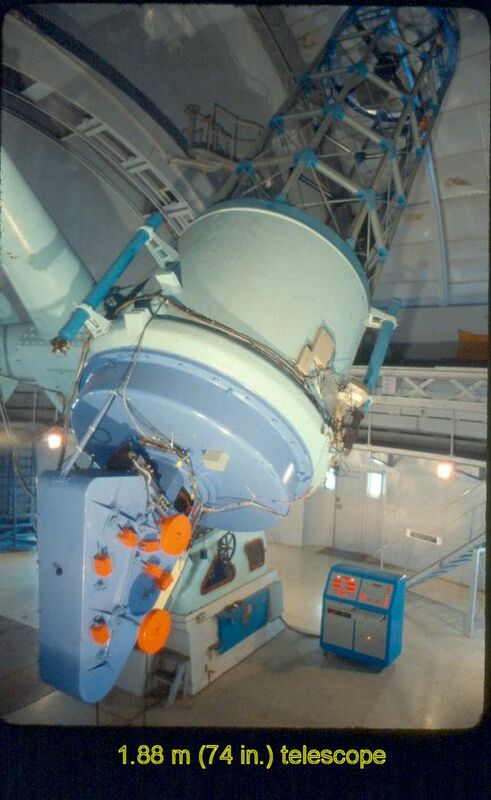 This telescope was equipped for classification-dispersion spectroscopy, photoelectric photometry, and direct photography, with CCD detectors being installed later. In 1992 it was named the Helen Sawyer Hogg telescope in recognition of Hogg’s lifetime of work on variable stars in globular clusters. 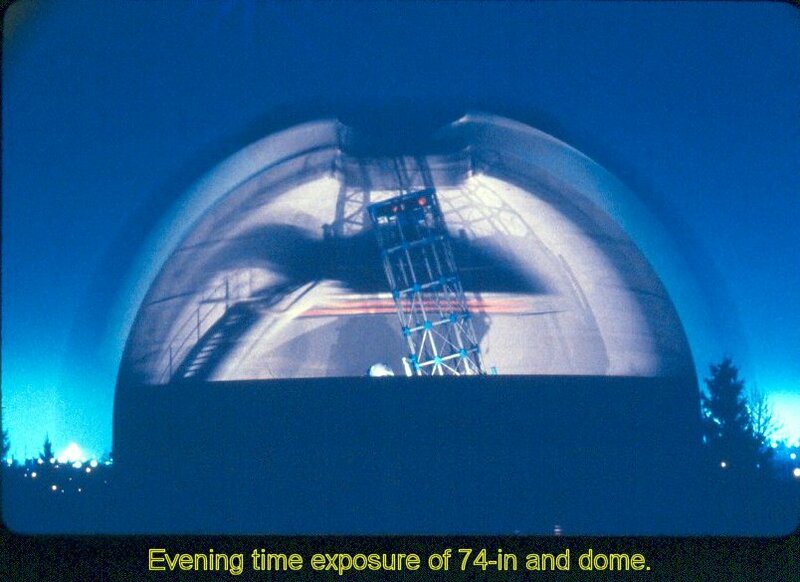 The telescope was enormously productive for more than a quarter-century, but eventually, as for many small telescopes everywhere, funding for its operating costs ran out and it was closed in 1997. It has since been taken over by CASLEO, the National Observatory of Argentina, and moved to their site at Parque El Leoncito in Argentina. 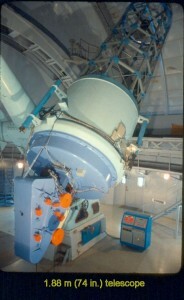 A quarter of the observing time will be available to the University of Toronto when the telescope is again operational in about 2001. A major advance came about in 1983 with the establishment of the Canadian Institute for Theoretical Astrophysics and its location adjacent to the Astronomy Department. The cross-appointments of CITA’s permanent staff as professors in DA enhanced graduate teaching and supervision, and in general the synergism between CITA and DA has been very rewarding. In recent years the observational advances of the department have joined the world-wide trend away from local or even institutional facilities in favour of participation in the extremely expensive national and international projects that more and more stand at the cutting edge of astronomy. A healthy future is forecast. The Department of Astronomy was renamed the Department of Astronomy and Astrophysics in March 2001. In the words of the Department Chair, “the new name more accurately identifies … that which we do and for which we take responsibility”.